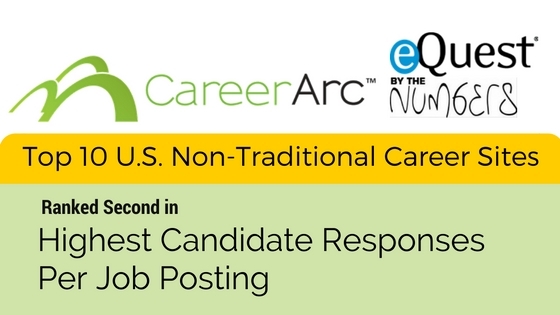 CareerArc was named one of the Top 10 US Non-Traditional Career Sites according to a recent report by eQuest. Over 500 career sites with a minimum of 100 active job postings were evaluated between June and August 2016, and CareerArc was ranked second in Highest Candidate Responses per job posting. View the full list below displayed in order of highest candidate activity. The report was released on Sept. 27, 2016 as part of eQuest’s By The Numbers HR analytics series. Read the official release here.